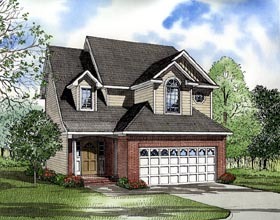 This plan is a lovely two story home perfect for entertaining. A cozy entry hall leads to an open floor plan containing a spacious Great Room, Kitchen and large Dining Room. The L-shaped Kitchen has an angled island serving as extra counter space and additional seating. Nearby is a corner grilling porch with columns for lazy summer afternoons. The upper level has a spacious Master Suite, two additional bedrooms, a full bathroom and nearby laundry room.